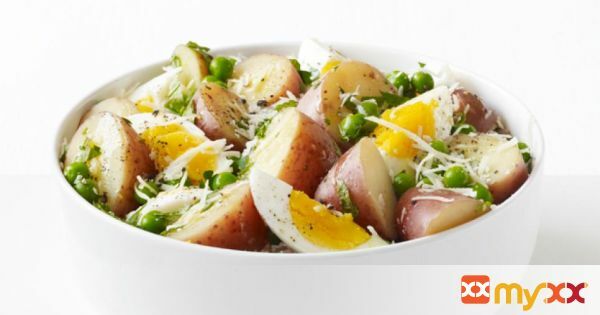 Try a light, spring-inspired take on classic picnic salads by tossing fingerling potatoes and eggs with green peas and fresh mint. 1. Boil 1 pound halved new potatoes, 10 minutes. 2. Add 4 eggs to the water; remove from the heat, cover and let sit 10 minutes. 3. Add 1 cup frozen peas; cover 1 minute. 4. Drain; peel and quarter the eggs. 5. Toss with 3 tablespoons olive oil, 2 teaspoons lemon juice, and parsley and mint. 6. Sprinkle with parmesan, salt and pepper.